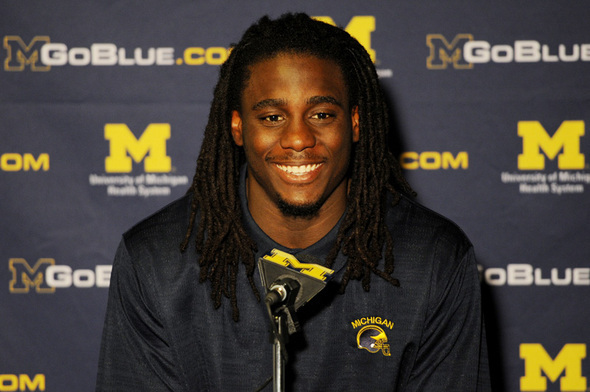 Posted on Thu, Mar 22, 2012 : 8:18 p.m.
Michigan quarterback Denard Robinson was, as usual, all smiles at a Thursday press conference. The Michigan football team has four spring practices in the book, and has already donned full pads for the first time. Quarterback Denard Robinson discussed his new role as a more vocal leader within the program, and also touched on what he's trying to work on this spring. Brady Hoke, meanwhile, talked about the team's physical play early, and noted a few emerging leaders on both sides of the ball. Fri, Mar 23, 2012 : 1:25 a.m. I hope Denard's charming smile and appearance of confidence translates into much better decision making on the field of play and I hope that smile signifies the much needed confidence to be a team leader this his senior year. I think what little I know of Denard as a student and football player he appears to be a nice young man I also think this being his last year it's time to kick it into gear and I'm not referring to his great running ability, I'm referring to the other 50% necessary for a QB to be concidered among the elite, yes that's right I'm referring to his sporadic throwing capability which could very well affect this teams winning percentage this year unless Denard greatly improves his passing especially when our wide receiver situation could be iffy depending on Denards ability to start hitting those passes he missed constantly all of last year. Sun, Mar 25, 2012 : 11:59 p.m. Sounds like a Tebow thing...but all DRob and Tebow do is win. Fri, Mar 23, 2012 : 10:03 a.m.
Gotta love the insane run-on sentence. Fri, Mar 23, 2012 : 9:49 a.m.
Tell him again Terry. Maybe we should ask Nebraska and ohio about his sporatic throwing... Or better yet, we should give back the Sugar Bowl trophy and rings and tell the NCAA to vacate our 11 wins because we didn't deserve it... DRob has a noodle for an arm. No wait..wait...... we should sit DRob for the entire '12-'13 season, and hit the gridiron with Alex Sweizca as our quarterback... Yeah. GO BLUE!!! Fri, Mar 23, 2012 : 2:47 a.m. He's still smiling about the spanking he gave Ohio (Columbus) last November and thinking about how much fun it will be beating them next year with a new set of team mates that rejected that dirty university to play for a far superior Michigan program. Fri, Mar 23, 2012 : 9:32 a.m.
Maybe so lil fish, but hell we didnt have cheat to do it. And u say a bad ohio team, damn near the same exact players that lost go yall in '09 &amp; '10 put 40 up on yall in '11. I guess when u can't cheat u can't win. But im sure as a suckeye fan u can go get a free tatoo sumwhere in codumbus. GO BLUE!!! Fri, Mar 23, 2012 : 1:53 a.m.
Fri, Mar 23, 2012 : 12:51 a.m.
That smile will be wiped from existence next November in Columbus..enjoy it while you can. Sun, Mar 25, 2012 : 11:58 p.m.
Fri, Mar 23, 2012 : 2:42 a.m.
Fri, Mar 23, 2012 : 12:41 a.m. Thank you Denard for coming to Michigan. We are grateful. Fri, Mar 23, 2012 : 2:49 a.m.
Can't wait to see him this year, Michigan should run the table and DRob smiles as he leaves the drunkin' horseshoe 2-1 as a starter....too good !